On Saturday 9th September, the 2nd EUthyroid satellite meeting will be held in Belgrade, Serbia. This event has been organised in cooperation with the Iodine Global Network of Western and Central Europe satellite meeting as a pre-conference event of the 40th annual meeting of the European Thyroid Association. This theme of the meeting will be ‘Iodine – the European Landscape’. 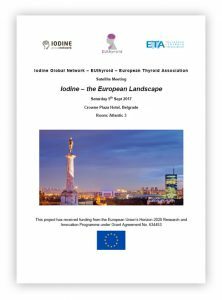 To address this topic the meeting will feature presentations from EUthyroid experts in addition to a number of guest speakers from organisations including UNICEF, EuSalt and the World Iodine Association. We look forward to a stimulating meeting with talks running the gamut from monitoring and improving iodine intake through evaluating IDD prevention programmes and addressing issues such as universal salt iodisation and health policy. The full programme can be viewed here and on the ETA website.